uShaka Marine World, Africa's largest marine theme park, is not only an integral part of the city's overall tourism offering and one of two anchor tenants along the world renowned Golden Mile, but an economic engine and success story within its own right. Created over 13 years ago to kick start urban regeneration and to boost development, uShaka Marine World has driven up footfall in what was a largely ignored and neglected part of the Durban beachfront. In more than a decade, it has been a catalyst for the growth of other hospitality businesses and the city's tourism offering as a whole. To date, uShaka Marine World has contributed some R2 billion to the Gross Geographical Product (GGP) of Durban, enjoying a 20% increase in footfall from 2014/15 to 2015/6 and an 11% increase in revenue in the last financial year. SUNCOAST, a 1.4 billion investment in the Durban beachfront, stands on the northern bookend of Durban's Golden Mile, as a proud citizen of Durban, having established itself as one of the key tourist attractions in the province, over the past 15 years. As an entertainment and leisure destination, Suncoast attracts approximately one million people to the complex on a monthly basis. A R70 million contribution to the People Mover continues to ensure easy access for visitors to all of Durban's main highlights, including SUNCOAST. 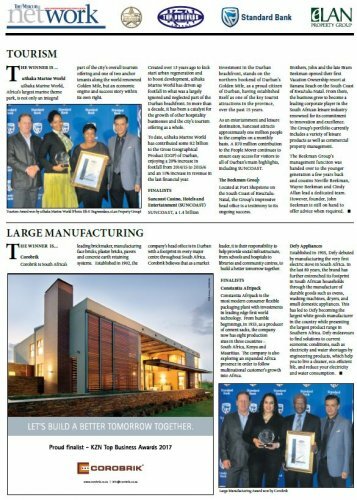 Located at Port Shepstone on the South Coast of KwaZulu-Natal, the Group's impressive head office is a testimony to its ongoing success. The Beekman Group's management function was handed over to the younger generation a few years back and cousins Neville Beekman, Wayne Beekman and Cindy Allan lead a dedicated team. However, founder, John Beekman is still on hand to offer a Tourism Award won by uShaka Marine World (Photo: ISh K Bugwandass, eLan Property Group) dvice when required.